CD Edition limited to 7500 non-numbered limited edition copies. The Complete Motown Singles, the acclaimed, long-running series encompassing every Motown single release of the Detroit era, begins its final phase this year with Volume 12A, a 5-disc set of the company’s output from the first half of 1972. The collection contains 113 remastered tracks with a 130-page book that chronicles the story of the year in which Motown uprooted from Hitsville and moved west. Martha Reeves & the Vandellas released their final single, “Tear It On Down.” Smokey Robinson & the Miracles began their official goodbye with “We’ve Come Too Far To End It Now,” while Stevie Wonder had a new beginning, issuing the independently-minded single, “Superwoman” and producing his then-wife, Syreeta. 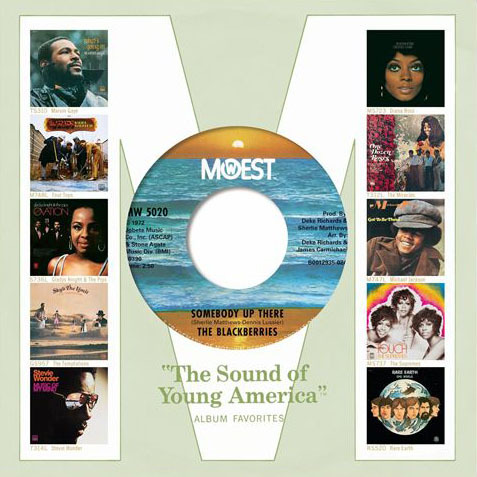 This volume features not only hits and B-sides, but rare tracks from a wide variety of artists: David Ruffin, the Supremes, the Temptations, Undisputed Truth, Blinky, Bobby Darin, the Devastating Affair, Eric & the Vikings, Thelma Houston, Rare Earth, Sisters Love, Edwin Starr, Frankie Valli, and more. This is Volume 12A of a 12-part box series. And, as is expected in this series, Vol. 12A is in “album” style packaging, with a bonus 7” vinyl single – this time, with two songs by the Blackberries never actually issued as a 45. The book features two essays: an introduction by the twin brothers Russ and Ralph Terrana, two key members of the Motown engineering staff, and an overview by Susan Whitall, a longtime writer for The Detroit News, plus detailed track-by-track histories by co-producers Keith Hughes and Harry Weinger, and Grammy®-nominated Bill Dahl.